Fazilka Ecocabs merges technology with tradition to improve transport in Indian cities. Photo by Fazilka Ecocabs. Cycle rickshaws, an eco-friendly mode of transport, continue to play a role in para-transit and non-motorized modes of transport in Indian cities. 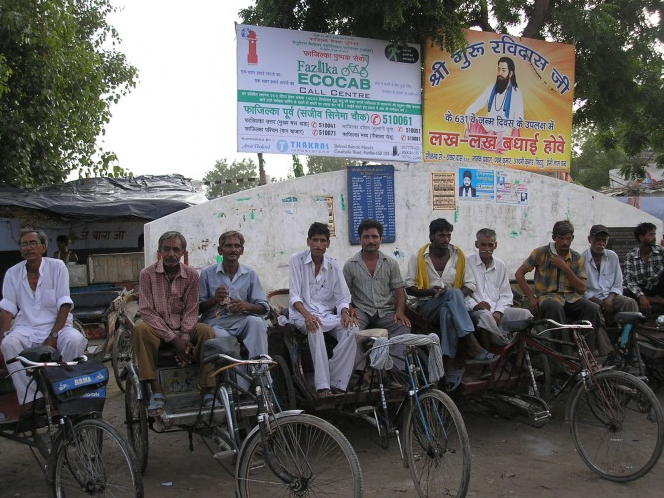 The world’s first dial-a-rickshaw service, Ecocabs, was initiated in Fazilka, Punjab in 2008 by Graduates Welfare Association Fazilka, an NGO dedicated to education, employment, environment and energy. The concept was successful, and it has now been taken to 21 other cities in the state of Punjab. The key to the cycle rickshaw—or ecocab—operations has been the improvement of the existing rickshaw design, along with the introduction of a hub-and-spoke model of operations. In Fazilka, nine call centers have been strategically spread around the town, and each of these serve an average of 1,500 households. The cycle rickshaws are ergonomically designed and are offered at a very affordable price. The service is usually available between 9:00 a.m. and 6:00 p.m. The scheme functions very similar to the dial-a-cab service and all rickshaw pullers, also known as traction men, have been provided with cell phones. The ecocab services are operationally efficient and include benefits for the rickshaw pullers, users and society at large. With the success of the scheme and national-level recognition of it, several other cities, including Delhi and Jaipur, are considering implementing a similar dial-a-rickshaw system. In addition, the idea also finds mention in the country’s 12th Five-Year Plan, under the low carbon mobility agenda.